The great insight of George Fox and the early Quakers (AKA the Religious Society of Friends) was that each human person has 'that of God' within them. Overlaid as it may be by passions and material desires there is nonetheless a Divine seed ever present. In silence and stillness we can uncover this presence within and it, or more properly He, can act as an Inner Light which can guide us into fulfilling all righteousness. It is characteristic of those movements or ideas which the Church defines as being heretical that they are in possession of one or more elements of divinely revealed truth. The problem is that they over-emphasise those elements to such an extent that they overshadow other parts of the same revealed truth and, in due course, end by denying them altogether. This is the reason why Christianity has often been riven with disputes about seemingly trivial points. The defenders of orthodoxy, like St Athanasius, have had the wisdom to see the end concealed in the beginning and so excise the error from the body of Christ before it contaminates the whole. In this context it is instructive to read the early apologists for Quakerism such as Robert Barclay and William Penn (who put the Penn in Pennsylvania.) They fiercely refuted criticisms that Friends denied the unique salvific power of Jesus or the importance of Scripture or the doctrine of the Trinity and so on. It was certainly true that Quakers of that era denied none of those things. It is also true that by the time we reach the 21st century most Friends had discarded these doctrines as inessential if true and possibly not even true. The point being that if the Inner Light is a true guide no other guide is needed. However, I come to praise Quakerism not to bury it, or not entirely bury it anyway. The primitive insight is true enough, we do have an inner citadel of our hearts in which God resides and in stillness and silence we can find our way to Him. I think it will be useful to look at George Fox himself and ask why it is that he accepted as a given so many orthodox Christian propositions which his spiritual progeny have now effectively abandoned. 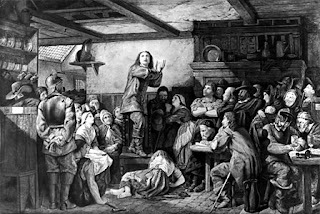 From a young age Fox was possessed with a divine discontent, he perceived that not only were the times out of joint (he lived during the period of the English Civil War) but that he too was out of joint with himself. Like a latter day Socrates he wandered around questioning people about their beliefs and seeking to find from them answers to his own inner restlessness. More than that he devoted himself to reading the Bible assiduously, he became so saturated with scripture that he practically memorised the entire text. And, not least of all, many hours were devoted by him to prayer with inexpressible groanings (Romans 8:26) It was not until he had done these things for some considerable time that he first had his 'openings from God' as he termed them. We can see from this that uncovering the Inner Light lies at the end, not the beginning of a process. Many of his successors, perhaps particularly those born into Quaker families, seek the Light without serving the apprenticeship and not surprisingly find a different sort of light altogether from that of George Fox. It is plausible, I think, to contend that the spiritual journey which Fox undertook in and of itself refutes the conclusions which he came to. Either all his mental anguish, questionings, study and prayer were a waste of time and he would have achieved the same end by staying quietly at home or else they formed, in whole or in part, a necessary pre-condition to him receiving the 'openings' and having the tools to interpret them. In which case the Inner Light on its own is insufficient as a guide. The philosopher Wittgenstein famously said that if a lion spoke we could not understand him, we would both have such wholly different reference points. To some extent this must apply when God speaks to us. Jesus Himself during His earthly mission was frequently radically misunderstood when He spoke. Not only His enemies but even those who loved Him most and knew Him best did not grasp His meaning all the time. Why should we suppose that we will be better at understanding 'Christ, the true teacher within' than the Apostles were at understanding the actual Christ in the flesh? It might be said that the original sin of Protestantism is hyper-individualism and the early Quakers were the product of a very Protestant society. This meant that, logically enough, they applied the principle that each ploughboy was his own Pope, when it came to interpreting scripture, to the Inner Light as well. Since the Light was immediate and personal it was felt to be superior to scripture at least in the sense that the Bible was interrogated by the Light not the Light by the Bible. Which puts each individual in the driving seat as the final authority on all spiritual matters provided they can assert that the Divine seed provides them with a warrant for their actions. Had the movement arisen, like the Franciscans, as a prophetic revival in a Catholic country then it would have been able to assert the same original insight, there is 'that of God' in each of us, but would have accepted that the tools to fully understand what it is saying to us may not wholly rest within ourselves. The shared wisdom of our brothers and sisters in Christ may be better at interpreting what we have heard within ourselves than we are. And that, after all, might be one reason why God made Church in the first place.